Pride and Prejudice was the first Jane Austen book I ever read. Picking it up was a part of my ongoing project of reading classics that I skipped in college. Knowing nothing about it, looking at the cover, I thought it might be a novel about upper class England and, although the book does deal with the upper class, it mostly deals with a middle class family. The Bennet family, consisting of Mr. And Mrs. Bennet and their five girls, Jane, Elizabeth (Lizzy), Mary, Catharine (Kitty), and Lydia live in relative comfort, but without great wealth. However, with no male heirs, their estate has been entailed to a Mr. Collins, so that when Mr. Bennet passes, his wife and daughters will only have a very small amount of money–and no property–for their survival. It is incumbent on the daughters, then, to marry well. When a Mr. Bingley moves in to the one great estate in the area, Mrs. Bennet is determined that he should marry one of his daughters. The book contains one of the most memorable opening lines of any novel ever written. Mr. Bingley has brought his good friend, Mr. Darcy, along with him. Possessed of a great fortune and a beautiful estate, Darcy appears cold, distant, and–to Lizzy’s eyes–arrogant. While Mr. Bingley begins an attachment to Jane, Darcy brought to an even lower esteem when a young militia man, Mr. Wickham, tells Lizzy that Darcy did him a great evil in denying him the living that Darcy’s father had promised. Lizzy forms an attachment with Wickham, but Mr. Collins then comes to town with the notion of marrying one of the Bennet girls and keeping the property in the family. When he proposes to Lizzy, however, she bluntly turns him down, so he instead marries her friend Charlotte Lucas. Mr. Darcy, seeing what is going on between Bingley and Jane, urges his friend to retire to London, so the whole party packs up and leaves. Jane is sent to London to stay with her uncle and aunt, Mr. and Mrs. Phillips, in the hope of reuniting with Bingley. In the meantime, Lizzy goes to visit Charlotte and meets Lady Catherine de Bourgh, Darcy’s aunt. When he shows up for a visit, he seeks out Lizzy and blunders out a proposal that takes her completely by surprise. Angry at his actions–destroying her sister’s chance of happiness and Mr. Wickham’s hopes of fortune–she refuses him in a very emotional scene. Of course, Mr. Wickham had lied about their past association. 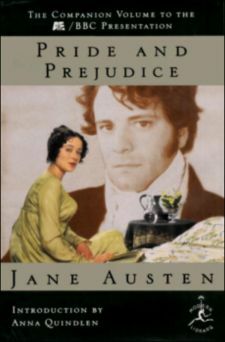 The twin subjects of pride and prejudice are fully examined, not only in the characters of Lizzy and Darcy, but in the supporting characters as well. All of Lizzy’s actions throughout the first part of the book are based on a quickly formed prejudice. Mr. Darcy’s apparent pride is actually a difficulty in dealing with new acquaintances. The same prejudice that put Mr. Darcy into a dim light also promoted the character of Wickham, who was actually a pretty bad person. Mrs. Bennet certainly feels a great deal of false pride, having no idea how ridiculous she actually is. Pride also appears in the form of Mr. Collins, whose obsequious fawning on Lady Catherine de Bourgh is both funny and insightful. Almost lost in this circus of pride and prejudice is the amazing change that comes over Mr. Darcy after Lizzy rejects him. When she points out to him his own pride, it shakes him up so much that it causes a complete alteration of his character, partly because he didn’t see himself clearly before and partly because Elizabeth thinks these terrible things about him. After Elizabeth receives his letter, she is forced to reevaluate her own thinking and ultimately realizes her own prejudice. The book is essentially a romantic comedy, but it touches on so many different aspects of English society at the beginning of the 19th Century that it ends up having a lot to say, without ever coming across as preachy. In dealing with such issues as women’s place in society, the economic structure of England, class relations, and child rearing, it reaches a very high level of storytelling, layering in themes far deeper than one would imagine in a romantic comedy. It remains one of the most influential novels ever written and has spawned numerous films, clubs, and so on. A wonderful novel! I highly recommend Pride and Prejudice to all readers!